Mormon Doctrine defines Christ's Passion, from the non-Mormon point of view, as “Our Lord's sufferings—the pain, torture, crown of thorns, scourging, and final crucifixion—which he endured between the night of the Last Supper and his death on the cross” (p. 555). Mormons believe that Christ suffered during that time and in those ways. The difference is that Mormons believe that his worst suffering (the real “Passion of Christ”), as well as the Atonement, happened in the Garden of Gethsemane. President Joseph Fielding Smith said that "A great many people have an idea that when he was on the cross, and nails were driven into his hands and feet, that was his great suffering. His great suffering was before he was ever placed on the cross. It was in the Garden of Gethsemane that the blood oozed from every pore of his body: 'Which suffering caused myself, even God, the greatest of all, to tremble because of pain, and to bleed at every pore, and to suffer both body and spirit--and would that I might not drink the bitter cup, and shrink' [D&C 19:18]. The Book of Mormon also backs up this belief in Mosiah 3:7, so Mormons believe it was there in the Garden that He underwent his greatest suffering for men, taking upon himself, as he did, their sins on condition of repentance (D&C 18: 10-15). This difference, alone, might not mean much because no one's salvation depends on which place and what time he suffered the most, and Mormons and non-Mormons alike appreciate Christ's suffering. However, there arises from this difference on Christ's Passion some things that are perhaps more significant. One is the use of the cross as a religious symbol, which arose as a result of the association of Christ with it. Mormons interpret non-Mormons as trying to sensitize themselves to Christ's exquisite suffering by displaying the cross ever before them. However, many Mormons are already extremely sensitized—some might say, hyper-sensitized. Mormons view displaying the cross as similar to having a much loved family member shot or knifed and then having to see a gun or knife—or their loved one being shot or knifed—always before their view. The cross was the murder weapon which killed someone they love with all their hearts. Mormons flinch from seeing it. It sears their sensitive feelings about his suffering. They feel grief when they are reminded of his torture and death. Mormons much prefer to think of Christ's overcoming death than of his suffering death. They like to think of his triumph, not his suffering and seeming defeat. Likewise, while Mormons may have paintings of Mary, the apostles, etc. on the walls of their meetinghouses, temples, and homes, they do display icons of them anywhere because they focus on Christ alone as Redeemer and Advocate. 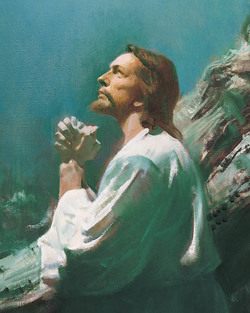 Christ is central to all aspects of Mormon worship: prayer in His name, baptism in His name, and praise to His name. This page was last edited on 28 September 2011, at 09:29.